Hacktivists from the Anonymous collective attack the Department of Justice and Finance websites over plans for the so-called ‘Irish SOPA’. 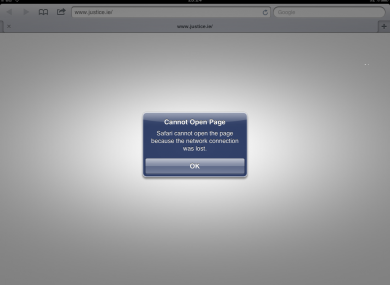 The website of the Department of Justice was inaccessible shortly before 11:30pm. THE WEBSITES of the Department of Justice and Finance were taken offline this evening after coordinated attacks by ‘hacktivists’ from the Anonymous movement. The Department of Justice site, justice.ie, went down at around 11:20pm after Twitter accounts affiliated to the Anonymous movement urged members to target the website with an apparent Distributed Denial of Service (DDoS) attack. The website returned to operation shortly afterward, but was taken offline again at around 11:40pm and did not return online until after 1am. At around 12:15am, after similar urges for action, the website of the Department of Finance also appeared to have been taken down, remaining sporadically offline until after 1am. Other minor government websites – including that of the Freedom of Information unit, www.foi.gov.ie, which is housed on the same servers as the Department of Finance website, and the ‘Blue Blindfold‘ human trafficking website which shares its host with the Dept of Justice – were also offline as a result of the attacks. Members of the collective had also distributed a list of phone numbers for Fine Gael and Labour TDs, including the home and mobile phone numbers of some Labour TDs including a cabinet minister. The list had previously been posted on discussion forums including Boards.ie. A Twitter account affiliated to the Swedish arm of Anonymous said the timing of the attack, when the websites would not be in heavy demand, was a “wake up – warning shot”. It also said the impact of the attacks on the Blue Blindfold and FOI sites had not been deliberate. The co-ordinated actions are in response to the government’s proposed reform of Ireland’s copyright laws, dubbed the ‘Irish SOPA’, which are due to be published in the coming days. The junior minister responsible for the legislation, research minister Seán Sherlock, has insisted that the legislation – which will be introduced in the coming week by means of a statutory instrument, meaning it does not have to go through the Oireachtas – is merely an affirmation of what the government already believes to be in law. Details provided by various ministers in November showed that the Department of Finance website was hosted externally from the government at a cost of around €5,800 per year. The Department of Justice operates its own website, and 24 other sites relating to its work, at a cost of just under €18,800 per year. Email “Government websites taken offline in Anonymous #OpIreland attack”. Feedback on “Government websites taken offline in Anonymous #OpIreland attack”.